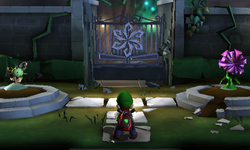 The Courtyard is an outdoor area of the Haunted Towers in Luigi's Mansion: Dark Moon. The Courtyard is a rather large area with two circular plots of dirt. In the bottom left and top right corners are two more plots of dirt and there is a pipe with running water at the top left corner. Various plants can be found in these plots of dirt, depending on the mission. There is also tall shrubbery that blocks wooden targets, which are brought up by standing on certain stepping stones. Taking the door to the left takes Luigi to the Tower Lobby while the door on the right takes him to the Hydro Generator. The area north takes Luigi to the Hollow Tree, but is inaccessible until the third mission. During A Job for a Plumber, there is a thorny plant a and a purple flower in the large plots of dirt. The entrance to the Hollow Tree cannot be taken because there is no running water to lift the platform. Instead of running water, the pipe in the top left leaks Gobber goo. In the bottom left and top right corners are two dandelions. Standing on the stepping stone on the left causes a wooden target of a Flytrap to appear, which gives out three coins when it is destroyed with the thorny ball from the plant. The entrance to the Tower Lobby is also blocked by a large leaf, which can be sucked up to drop many bills and coins. In The Pinwheel Gate, the two plots of dirt have dried up plants while the bottom left and bottom right plots have a purple flower and a dried-up thorny plant, respectively. The pipe in the top left has running water which can be used to water the dried plants. The stepping stone on the left brings up the Flytrap target, like in the first mission. The stepping stone on the right is missing, but the Dark-Light Device can be used on it to reveal it. Standing on this stepping stone causes a wooden target of a Greenie to appear. Destroying this target causes a Gold Greenie to appear. During Graveyard Shift, there are two potted plants in the large plots of dirt. The bottom left plot of dirt has two dandelions, a shovel, and a pitchfork while the top right plot has nothing. Luigi is attacked by three Slammers and a Greenie as well. In Pool Party, the two large plots of dirt have Flytraps in them that cannot be defeated. The entrance to the Hollow Tree and Hydro Generator are also blocked. In Doggone Key, Luigi will meet the Polterpup in the Courtyard. There is a thorny plant in one of the large plots of dirt. There is a dandelion hidden by Spirit Balls in the bottom left plot that will drop three gold bars when pulled. The stepping stone on the left will have the Flytrap target again, but the target on the right side is invisible because of Spirit Balls. Revealing this target and breaking it causes many bills, coins, and a gold bar to pop out. The player can see the Skybridge when they press to look up. Hiders messing with the gate. This page was last edited on September 12, 2017, at 20:11.